The Sedona International Film Festival is proud to partner with SedonaKind to present the encore of the multiple award-winning film “Liyana” on Tuesday, Nov. 13 as part of the Sedona Kindness Day celebration. There will be two shows at 4 and 7 p.m. at the Mary D. Fisher Theatre. The ticket price is a donation of $5 with proceeds to benefit five local schools to help provide much-needed supplies to help the children in our community succeed. “Liyana” has won numerous top awards at prestigious film festivals around the world, including the Directors’ Choice Best Documentary at the Sedona International Film Festival in 2018. The film — and its powerful message — return to Sedona for this special encore by popular demand as the fitting observation of Sedona Kindness Day. “SedonaKind chose this film because this year, our primary goal is to support our teachers and local schools in any and every way we can. Our Kindness in Schools Committee is in its third year of going into the classrooms at West Sedona School to present kindness programs to grades K-3, including reading, activities and even puppet shows,” said Joy Sinnott, SedonaKind liaison. 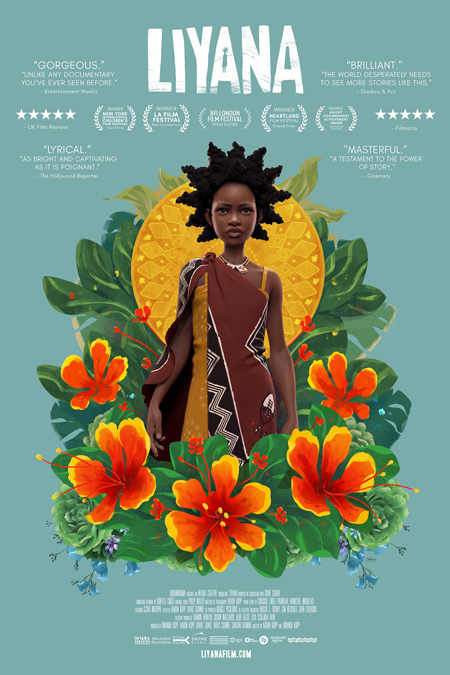 “Liyana” blends live action and gorgeous illustrated animation to tell the tale of an exceptional teacher and her orphaned students in Swaziland, as they create a myth to help the children triumph over their tragic circumstances and find a path to a better future. Under the guidance of acclaimed South African storyteller, Gcina Mhlophe, five orphaned children from Swaziland collaborate to craft a collective fairytale drawn from their darkest memories and brightest dreams. Their fictional character, Liyana, is brought to life in innovative animated artwork as she embarks on a perilous quest to rescue her young twin brothers. The children’s real and imagined worlds begin to converge, and they must choose what kind of story they will tell — in fiction and in their own lives. This genre-defying film weaves an original animated hero’s journey with poetic documentary scenes to create an inspiring tale of perseverance. “Liyana” is a tribute to creativity, the strength of the human spirit, and the healing power storytelling. Critically acclaimed, and executive produced by award-winning actress, Thandie Newton, “Liyana” has won more than 25 jury and audience awards and screened at more than 80 film festivals around the world including the British Film Institute’s London Film Festival and MoMA’s Doc Fortnight. “Liyana” will show at the Mary D. Fisher Theatre on Tuesday, Nov. 13 at 4 and 7 p.m. Tickets are a donation of $5 to benefit the area schools. For the third straight year, SedonaKind has an anonymous donor who will be matching all additional donations received that evening. For tickets and more information, please call 928-282-1177. Both the theatre and film festival office are located at 2030 W. Hwy. 89A, in West Sedona.